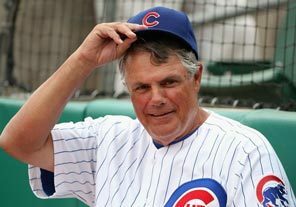 Lou Pinella, the coach of the Chicago Cubs has announced he’s retiring at the end of the baseball season. That makes 40 years in the major leagues, first as a player and then a manager. He won World Championships as both. I’m old enough to have seen him play, first with the Royals and then with the Yankees. When I was a kid in the late 60’s, my Dad would bring me to a few baseball games a season and I saw Lou play once. I never forgot him. Before the game he came over to the stands not far from where we were sitting and struck poses for some pretty girls there. Flexing his muscles and looking sharp for a camera that wasn’t there. That’s why they called him “Sweet Lou.” It’s not that they thought Lou was sweet. It’s that Lou thought Lou was sweet. Everyone sort of laughed at his arrogance. I just thought he was an idiot. But he did something during the game that I’m not sure I fully understood until recently. He was at bat early in the game with nobody on base. A ball was thrown knee high a little on the inside, and Lou did something surprising. He didn’t jump back. He stood his ground and pushed his leg out. The ball hit him square on the side of his knee. Do you have any idea how hard a major league pitcher throws? He didn’t even flinch. He was so intent on being the tough guy that he just dropped his bat and ran (slowly) down to first base. It wasn’t until today when my friend Gabriel told me that my last post ‘Possibility’ reminded him about the need to “lean into” his gifts. That got me thinking about Sweet Lou again. It also got me thinking that we spend a lot of time jumping back when things scare us a little. You see, Lou’s gift was not running or catching or throwing, though he was good at those things. His gift was and still is being a competitor. He saw an opportunity to get on base in that game and he went for it whether or not it scared him or hurt him a little. He didn’t think about the fear or the pain, he needed to stay true to his gift, so he just leaned in. Did he take one for the team? I don’t know, maybe he hated everyone on the team. I think he was just doing what came naturally to him. Making sure he capitalized on an opportunity to compete and win. Is it lack of self confidence that keeps us from fully leaning into our gifts? Could be, as Lou certainly seemed to have more than his share of confidence. I think the real lesson is that it’s more important to embrace our gifts and lean into every opportunity to use them. That can be scary for an Artist as every opportunity seems to come with a judgement about the work. Well, what would happen if we took the fear and potential pain of that judgement off the table? How about if we believed in ourselves and built a confident mind as opposed to concentrating on another’s beliefs about our talent which only erodes our confidence? Think about yourself for a minute. How far could that mental shift take you? I guess it all depends. Exactly how far are you willing to lean in?